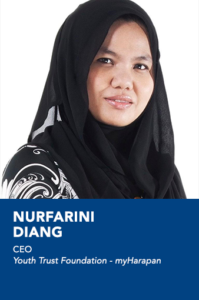 Nurfarini is co-founder and CEO of myHarapan, established in 2011, dedicated to developing independent and wholesome youth by empowering them with opportunities offered by social entrepreneurship. She was previously the general manager for 1½ years before assuming her role as CEO. She was previously with the Multimedia Development Corporation and headed the Project Management & IT services unit, Technopreneurs Development Department. She has 18 years of start-up experience and also did training and coaching for small enterprises and unemployed graduates. She is also mentor and coach to Malaysian social businesses and is a founding member of the Malaysian Social Business Network.